Brooklyn, NY – May 16, 2015 – Joe Bloch is best known for his mesmerizing paintings and illustrations. Out of his small studio and gallery based in Dumbo, Brooklyn, he is excited to begin creating a new series called “Living in Brüklyn”, which is a collection of paintings, product, and prints that offer an alternate view of the famous Brooklyn, New York. In order to make this series possible, Bloch has launched a KickStarter campaign to raise funds by June 13th, 2015. All art pieces are inspired by industrial Brooklyn, street art, impressionism, and graphic design elements. Joe hopes to bring forth a creative art that will leave a lasting impression on anyone that sees it. The “Living in Brüklyn” collection is made with a creative and meticulous technique to create layers built up over many days using acrylics. There are different methods used to enhance the colors and overall appearance of the artwork. The series provides a one-of-a-kind appearance under certain lighting conditions. This process takes a lot of time and is not an easy feat for an artist to achieve the desired effects. Using Joe’s many experience and talent as a painter, he will bring something new and exciting for the world to enjoy. Those wishing to make a contribution can do so by visiting the Kickstarter campaign. Backers get to choose from many exclusive rewards as a “thank you” for the support. Perks range from signed prints, products, and original paintings. Joe has over 25 years experience in painting and illustration. He was trained at RIT with a BFA in illustration and painting. Joe spent 10 years doing anatomical illustrations for medical books, and now focuses his talents on illustration and fine art. His highly textured acrylic paintings are a fusion of impressionism and industrial surrealism merged with street art on a canvas. Joe draws on his technical illustration background, fine art, art direction, graphic design and gritty Brooklyn history as an inspiration. His use of a vibrant contrasty primary palette with metallics creates a sense of drama unique to the art world. 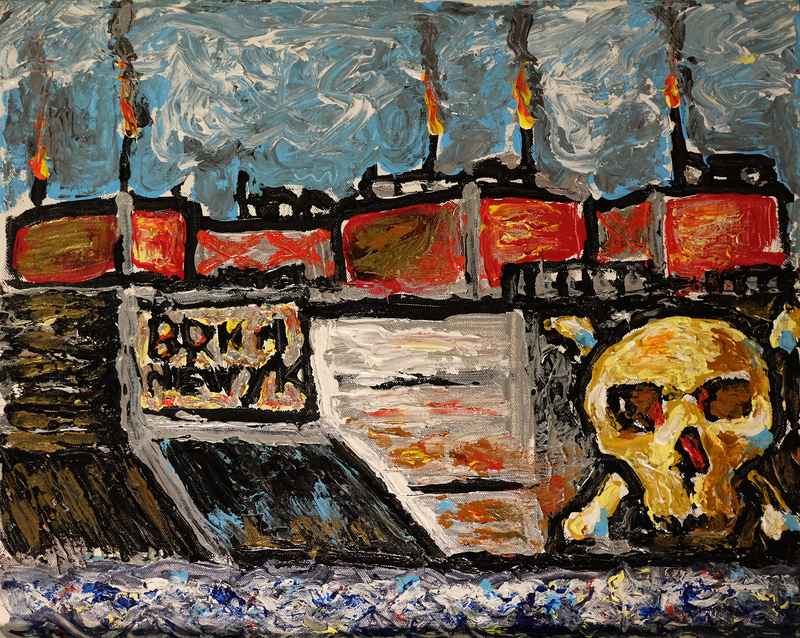 His paintings are described as “heavy metal on a canvas” and “raw Brooklyn industrial”. Joe is available for fine art commissions as well as commercial assignments. To view his designs visit www.creativebloch.com.